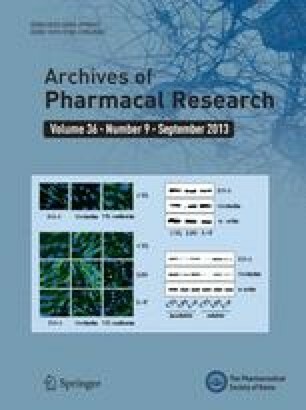 Triterpenoids and flavonoids isolated from Alnus firma S. Z. were found to inhibit HIV-1 virus replication and controlled its essential enzymes. In this study, the inhibition of HIV-1 viral replication and its essential enzymes, such as reverse transcriptase, protease and α-glucosidase, were observed using 18 Korean plant extracts. Among the extracts, the methanol extract of Alnus firma leaves showed potent inhibition against the HIV-1 induced cytopathic effect (CPE) in MT-4 cells on microscopic observation (the minimum concentration for complete inhibition of HIV-1 induced CPE, IC=50 μg/mL). Thus, 14 compounds were isolated and identified from the methanol extract of Alnus firma leaves. Of these compounds, the alnustic acid methyl ester exhibited inhibition against HIV-1 protease, with an IC50 of 15.8 μM, and quercetin, quercitrin and myricetin 3-O-β-D-galactopyranoside displayed inhibition against HIV-1 reverse transcriptase, all with IC50 values of 60 μM. Based on these results, the viral replication inhibition of the methanol extract of Alnus firma leaves was adjudged to be acutely related to the protease inhibition activation of the alnustic acid methyl ester as well as the reverse transcriptase inhibition activation of flavonoids.